Ok, show of hands (and if you raise your hand, well I’m worried about you), but who here had the Zoom Audio H1 digital audio recorder as part of their first camera setup? 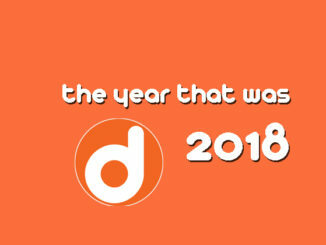 Well you know what? I still use mine as a recorder for either backup audio or scratch track. It’s a great, though basic recorder. And seven years later, it’s finally getting a new coat of paint with the new H1N. OK, not paint, strictly speaking. The new H1N has some new fins, which are designed to make using the recorder even easier than its predecessor. These features include including a redesigned layout of all the key control buttons, higher speed USB 2 connectivity (I wonder why they didn’t just go USB 3), direct support as a USB audio device, and instead of using one AA battery, it now uses 2 AAA batteries for up to ten hours of battery life. You can even power it via USB if you’re recording on your PC. And that means it’s not only a digital recording interface, but also a microSD card reader! This thing is a Swiss army knife of features. 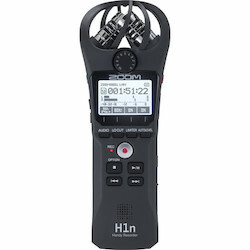 The H1N also has 24 bit recording at up to 96 kHz in WAV, and adjustable playback speeds for transcribing or learning of songs. That’s a nice handy feature. 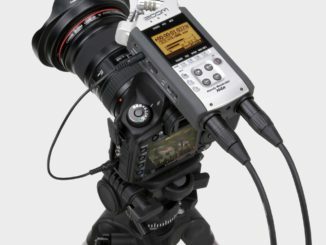 The X/Y microphone configuration looks about the same as the previous H1, but there’s also a lo cut filter, on board limiter and a one touch speech reset button to optimize dialogue. Another very interesting feature is a built in on board slate feature, that will help to calibrate and sync audio when editing your recording in your NLE. But musicians can enjoy the new overdubbing feature that offers unlimited layers of audio for a richer sound recording. WOW. Can we use that for dialog too? Of course you can. There’s also timer, prerecord, and auto record functions, and the standard mic line and headphone jacks. There’s even a redesigned volume knob on the front that makes easier to adjust the gain, or the standard rocker volume control on the side if you like it old school. 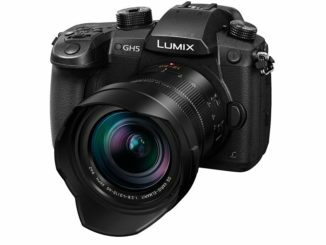 But it’s best feature may be it’s price, which has an MSRP of $119 at B&H. Not a bad rate, but you know what means … even though the original Zoom H1 has been discontinued, there are still some supplies left online if you know where to look. So you can also get the previous model for about half the price at Amazon. 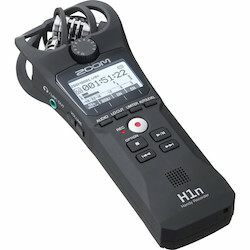 Either way, the Zoom H1N is still a very capable and affordable handheld audio recorder. Ideal for the one man crew looking to lay down a quick interview, or to get an audio track for that short film. Check it out at Zoom-na.com.